ProcessMaker is an online software program that automates form based, approval driven workflow and improves the way information flows between data and systems. In particular, it provides an intuitive, drag-and-drop interface that makes it easy for business analysts to model approval-based workflows. 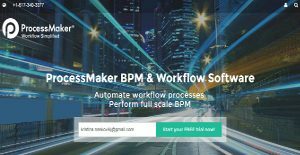 Futhermore, ProcessMaker is a cost effective and easy to use open source business process management (BPM) and workflow software application. It is extremely efficient, lightweight, and has one of the lowest overheads of any workflow software in the industry. Subject matter experts and business analysts choose ProcessMaker as their workflow software solution because they can accomplish more and communicate with their technical teams more efficiently. ProcessMaker workflow software features an extensive toolbox which provides the ability to easily create digital forms and map out fully functioning workflows. The software is completely web based and accessed via any web browser, making it simple to manage and coordinate workflows throughout an entire organization, including user groups and departments. Its Process Designer provides an intuitive drag-and-drop process modeling tool that is 100% web based and allows users to create and edit process diagrams using the BPMN 2.0 standard (Business Process Modeling Notation). There is also the Output Document Builder which helps create electronic receipts, letters, confirmations, invoices, contracts or any other type of printable output document that can be added to activities where a printable form needs to be generated with auto-filled information collected during the process. Users can create roles, groups, and departments as well to customize processes for the unique structure, reporting requirements and chain of command in the organization, from managing leaves to shift case loads. Its dashboards and key performance indicators (KPI) provide decision makers with full visibility to see how processes and employees are performing. There are nearly unlimited options for creating personalized dashboards. Users can also keep track of the progress of requests they have initiated or requests that require their input. If you are considering ProcessMaker it may also be a good idea to investigate other subcategories of Best Business Process Management Software gathered in our database of B2B software reviews. Every organization has different wants and requires a system that can be personalized for their size, type of employees and clients, and the specific industry they are in. For these reasons, no software can provide perfect tools out-of-the-box. When you try to find a software app, first be sure what you require it for. Read some ProcessMaker reviews and ask yourself do you want basic features or do you require sophisticated functionality? Are there any industry-specific features that you are looking for? Obtain the answers to these questions to aid your search. There are plenty of aspects that you need to consider and these include your budget, particular business wants, your organization size, integration requirements etc. Take your time, try out a few free trials, and finally zero in on the platform that presents all that you want to enhance your company efficiency and productivity. How Much Does ProcessMaker Cost? We realize that when you make a decision to buy Business Process Management Software it’s important not only to see how experts evaluate it in their reviews, but also to find out if the real people and companies that buy it are actually satisfied with the product. That’s why we’ve created our behavior-based Customer Satisfaction Algorithm™ that gathers customer reviews, comments and ProcessMaker reviews across a wide range of social media sites. The data is then presented in an easy to digest form showing how many people had positive and negative experience with ProcessMaker. With that information at hand you should be equipped to make an informed buying decision that you won’t regret. What are ProcessMaker pricing details? What integrations are available for ProcessMaker? If you need more information about ProcessMaker or you simply have a question let us know what you need and we’ll forward your request directly to the vendor.